3D games from a unified interface. It provides a comprehensive set of common tools, so that users can focus on making games without having to reinvent the wheel. Games can be exported in one click to a number of platforms, including the major desktop platforms (Linux, Mac OSX, Windows) as well as mobile (Android, iOS) and web-based (HTML5) platforms. #### Free, open source and community-driven Godot is completely free and open source under the very permissive MIT license. No strings attached, no royalties, nothing. The users’ games are theirs, down to the last line of engine code. Godot’s development is fully independent and community-driven, empowering users to help shape their engine to match their expectations. It is supported by the Software Freedom Conservancy not-for-profit. 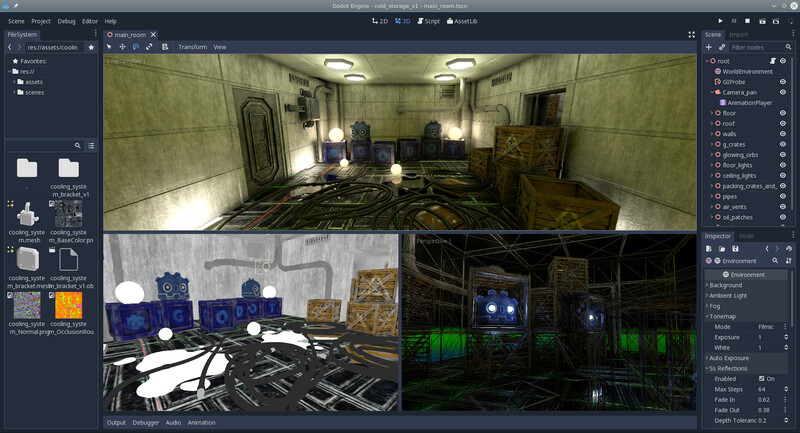 Before being open sourced in February 2014, Godot had been developed by Juan Linietsky and Ariel Manzur (both still maintaining the project) for several years as an in-house engine, used to publish several work-for-hire titles.